I decided to binge-watch this a few days ago. After all, my anime quota for the year is down and I was hoping that a short eleven episode anime would be able to help inflate my numbers a bit. I want to reach forty titles by the end of the year and right now I am sitting at a paltry twenty-five. Of course, I took into account that I've watched nine seasons of One Piece and seventeen seasons (give or take some filler seasons) of Naruto Shippuden this year, too. But, just like things go in the workplace, the result is the only thing that matters and everything else is an excuse. So I'm short of my self-imposed quota for the year with less than four months to go. I am ashamed. I'll do better. Believe it or not I've had Tokyo Magnitude 8.0 on blu-ray for a while, but I had never seen it before. I find it odd how I can be in a mood to buy things but not in a mood to watch them. I'm sure I'm not the only one who does that, but it's certainly an odd behavior nonetheless. I watched it without even thinking that the anniversary of 9/11 was approaching. Had I thought about it, I probably wouldn't have been in such a mood to watch it. Well, actually that isn't quite true. I wasn't in a mood to watch a specific anime as much as I was just in a mood to watch something to kill the time between morning boredom and night shift. At eleven episodes, this seemed ripe for a binge-watch. When I think about disaster shows and flicks the content is almost always kind of corny and/or action-packed. For some reason the title of this anime made me think about all of those crummy SyFy movies and I really wasn't sure how to approach it. I watched it, anyway. I found myself quite shaken by the time I finished. 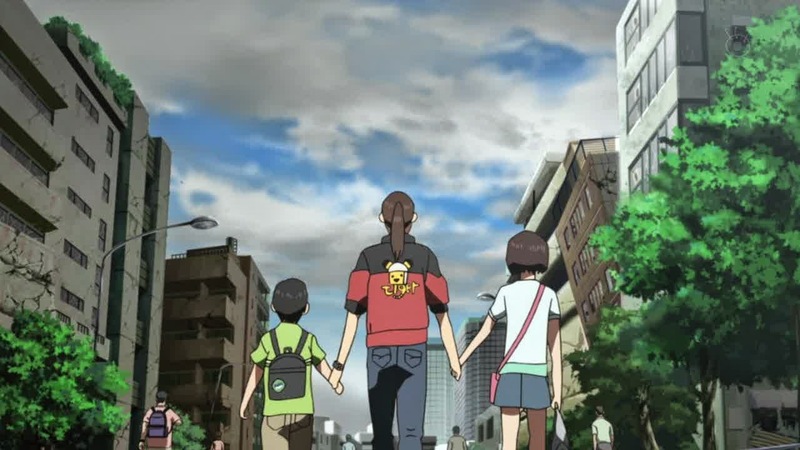 This anime certainly prides itself on being very accurate in depicting what might happen should an 8.0 earthquake ever strike Tokyo. Looking at it, although it was animated, it certainly seemed more realistic than The Day After Tomorrow. For one thing, this anime was simpler and grittier. With a much narrower scope than a lot of disaster flicks, Tokyo Magnitude 8.0 felt so much more immediate and intimate. But it isn't the science that drives this series. This story, for the most part, follows three people as they try to make their way home on foot after Odaiba has been damaged by the massive quake. The distance they must travel is a cushy nine miles. Mirai is a first year middle school student and her younger brother Yuuki is a third year elementary student. They are in Odaiba to see a robot exhibition. Of course, Mirai didn't want to go because she thinks doing stuff during her summer vacation is annoying. She doesn't even want to take any summer courses, the little slacker. While in Odaiba the two of them are stranded in the aftermath of the disaster. There parents are back at home, a thirty minute drive away, and the two of them have no way of knowing if their parents are even alive. From the group of survivors around them, they run into the familiar face of Kusakabe Mari. Mari is a motorcycle courier and is in the mall looking for a birthday gift for her daughter. 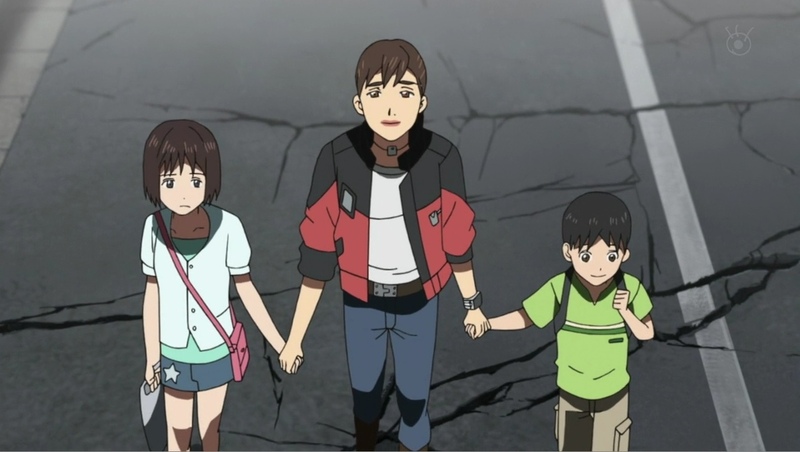 Desperate to get back to her daughter but unwilling to let two children wonder home alone, Mari promises Mirai and Yuuki that she will stay with them until they can all get back home. Of course, none of them can be sure if the have any homes or anyone to come home to anymore. I honestly didn't want to continue after a while because I could sense that not everything would end so nice and cheery. I mean, despite the massive earthquake and all, the series started out deceptively carefree. There were even moments where Mirai and Yuuki continued on like nothing happened. This is mostly thanks to Yuuki and Yuuki is indeed an angel. Mirai remains distant and moody at first, but soon begins to open up not just to her brother but to Mari as well. The three bond and it almost seems like a surrogate family. But nothing is really peaches and cream. Everything has been destroyed and there's nothing thrilling about watching life falling apart. We watch and we are horrified because something like this really could happen and probably will sometime in the future. Or even now. This is not an easy series and it does not get easier. Do not be deceived. This is indeed a tragedy and it will leave you with a knot in your stomach. 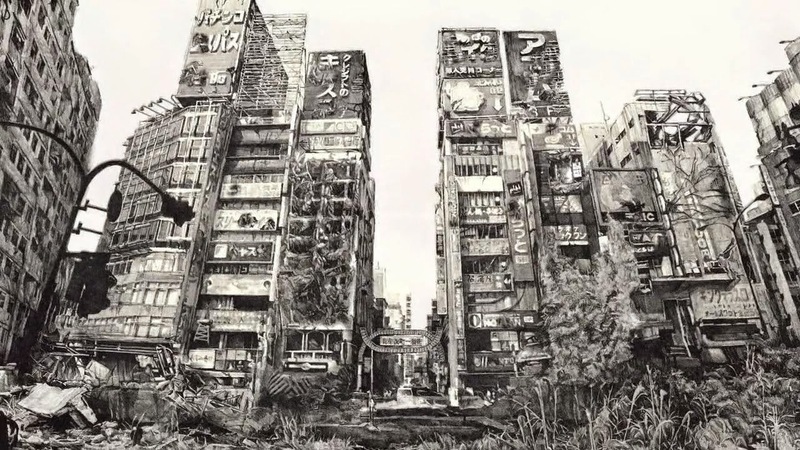 This anime will move you in a way that I think only a film like Grave of the Fireflies could. If you want action or cheesiness or comedy then look elsewhere. This is for the heart. "I find it odd how I can be in a mood to buy things but not in a mood to watch them. I'm sure I'm not the only one who does that, but it's certainly an odd behavior nonetheless." I have tons of books that I haven't read and movies I haven't watched and even a few cds I've never listened to. I have to be in the right mood to watch, read or listen to something. Sometimes I buy stuff knowing I'll be in the right mood some day XD. Especially books. It's a really big deal picking the next book I'm going to read. It's such a commitment to read a big novel, I always want to be in the perfect frame of mind. Music wise, I am a very streaky listener. What I mean is that I binge on a certain type of music or artist. I may get in a Rolling Stones mood and listen to nothing but that for 2 or 3 weeks. Then it can be a very long time before I listen to them again. So I buy stuff when I may not be in the mood for it but I know I will be someday. I do think I have some 30 year old paperbacks around that I've never read. I don't throw them out either. I'm a pack rat as well as serial buyer of things I don't read XD. Having a Kindle and things like Amazon Prime make it even easier to just load up on stuff I won't even touch for six months or a year, too. Especially when books are only a couple of bucks.